Alan Reiach lived from 2 March 1910 to 23 July 1992. He was an architect and urban planner. The wider picture in Scotland at the time is set out in our Historical Timeline. Alan Reiach was the son of Herbert Reiach, a printer, and was born in London. He moved to Edinburgh with his aunt at the age of 11 and attended Edinburgh Academy. In 1928 he became an apprentice to Sir Robert Lorimer. Meanwhile, he also studied part-time at Edinburgh College of Art (ECA) under John Begg. On completing his apprenticeship, he studied for two years full time at the ECA. He became an Associate of the Royal Institute of British Architects in 1934, and subsequently gained his Postgraduate Diploma in Town Planning. In 1935 he gained a travelling scholarship that allowed him to tour Eastern Europe and Russia. He also travelled in the USA, where he met the architect Frank Lloyd Wright. After a brief period working in London, Reiach became a Research and Teaching Fellow at the Edinburgh College of Art in 1938. In 1939 he established his own practice in Edinburgh, and in 1940 he joined the Scottish Office's Clyde Valley Regional Planning Study Team that recommended creating New Towns around Glasgow. During the Second World War he also served as assistant secretary of the Scottish Housing Advisory Committee at the Department of Health. After the war he became a senior lecturer at the Edinburgh College of Art, and re-established his architectural practice, taking on Stuart Renton as a partner in 1957. In 1965 Alan Reiach & Partners merged with Eric Hall & Partners to form Reiach & Hall. Among the major projects Reiach worked on during this period were Appleton Tower, built in 1967 for the University of Edinburgh, part of a now controversial redevelopment of Edinburgh's George Square. 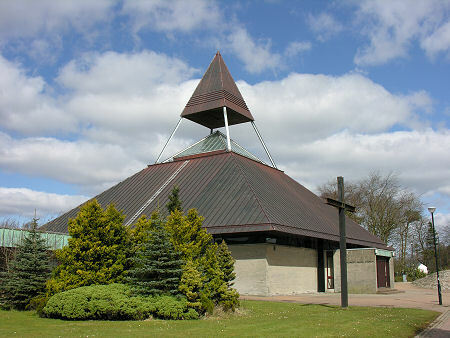 The practice also worked on many other new developments, ranging from the British Steel Corporation's Imperial Works at Airdrie in 1977 to St Mungo's Parish Church in Cumbernauld in 1964. Alan Reiach was awarded an OBE in 1964, was a member of the Royal Fine Art Commission from 1966 to 1980, and was elected to be an associate of the Royal Scottish Academy in 1969. As an accomplished artist he was elected to membership of the Scottish Arts Club and the Royal Scottish Society of Painters in Watercolour. He died in 1992 and was survived by his second wife, Patricia and their two children.